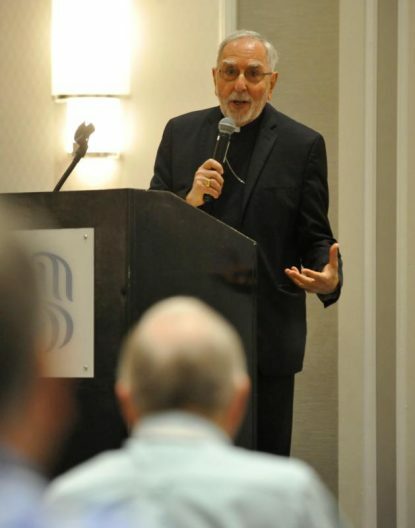 NEW ORLEANS (CNS) — Bishop Gerald F. Kicanas was rector of Mundelein Seminary in the Archdiocese of Chicago in the 1990s when then-Cardinal Joseph Bernardin was falsely accused of sexually abusing a minor seminarian during his previous tenure as archbishop of Cincinnati. The agony of having to endure those humiliating charges — the accuser later recanted, removed Cardinal Bernardin’s name from his abuse lawsuit and reconciled with him — changed Cardinal Bernardin forever, Bishop Kicanas told the Louisiana Priests’ Convention in a keynote speech Sept. 21. But he changed in a way that strengthened his reliance on God in everything he did, said the bishop, who heads the Diocese of Tucson, Arizona, and is the former vice president of the U.S. Conference of Catholic Bishops. “When as priests we are in touch with our own weakness, only then can we enter the pain and brokenness of others,” Bishop Kicanas said. Cardinal Bernardin died in 1996 of pancreatic cancer. Bishop Kicanas said Cardinal Bernardin visited Mundelein the following week and spoke directly with all the seminarians in a large, tiered room. Bishop Kicanas said Cardinal Bernardin “paused for a seemingly interminable time” and finally said, “I was totally embarrassed, totally. Here I am, the cardinal archbishop of Chicago, accused of sexual misconduct with a minor, my name on the headline of every newspaper, even in my (family’s) hometown in Italy. I was totally embarrassed.